My family went to Pigeon Forge, Tennessee for a week and we ate at the Apple Barn. 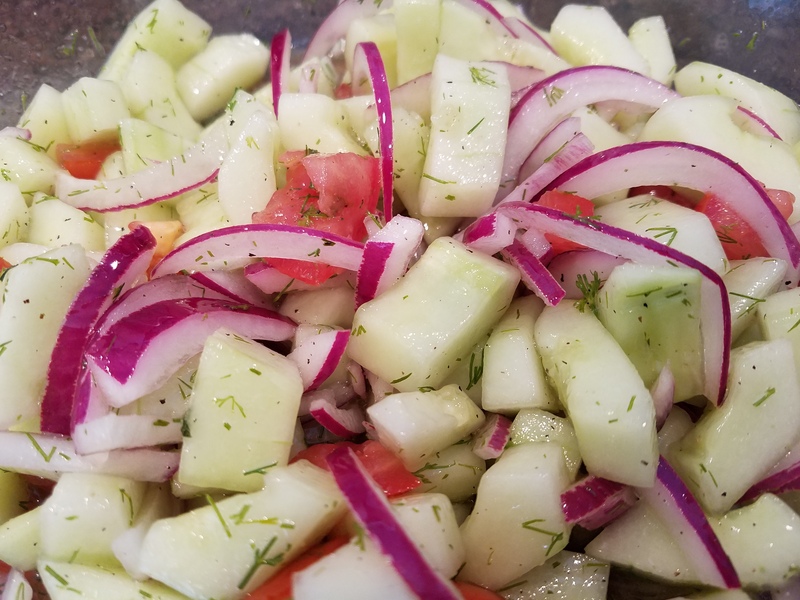 I had a side called cucumber salad and this is my interpretation of it. Prep all vegetables and put in a large bowl. Mix the remaining ingredients to form a dressing and pour over vegetables. Store well and refrigerate until ready to serve. 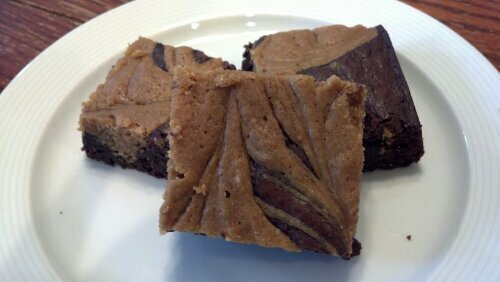 Yummy, these are some rich gooey brownies! I had a bunch of biscoff spread and searched for recipes. I discovered this one from the blog http://www.bakeat350.com (great blog name by the way). The recipe is simple to follow and the result is way too decadent not to share! Preheat over to 325 F. Spray a 9 x 13 pan with cooking spray. Combine all ingredients for biscoff swirl and set aside. Combine cocoa, baking powder, and salt in a bowl and set aside. In a saucepan melt the butter on low heat. Add the sugar and stir until warmed. Remove from heat and mix in the cocoa mixture. Next whisk in the eggs and vanilla until combined. Stir in the flour. Pour into baking pan and smooth to even layer. Plop the biscoff mixture in a random pattern in the brownies. Then take a knife and swirl the mix around to make a pretty design. Bake for 30-35 minutes. Cool and cut into delicious squares. This recipe was in USA Weekend in Sunday’s paper in January. 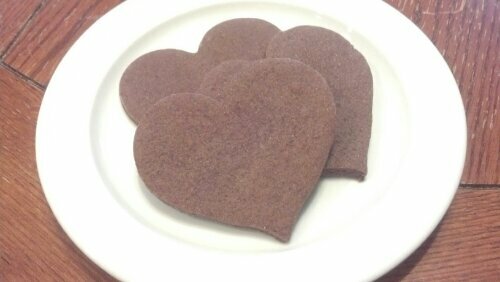 I made the cookies in heart shapes for Valentine’s Day. They came out pretty good. Not super sweet and they have a brownie taste. They tasted better the next day after being in an airtight container overnight. 2. Whisk the flour, cocoa, salt and baking powder, and set aside. 3. Beat butter and sugar with electric mixer until fluffy. Add eggs, one at a time, scraping down bowl. Mix in vanilla. Gradually mix in the dry ingredients. Wrap in plastic and chill for at least 1 hour. 4. Roll out the the cookie dough on a floured counter to a thickness of 1/4 inch. Cut into desired shapes, brushing extra deposits of flour off the top. 5. Bake on a parchment lined baking sheet for 11 minutes, until the edges are firm and the centers are slightly soft and puffed. 6. Transfer to a wire rack to cool. Store in an airtight container. I’ve been making this delicious recipe for years. I originally found it on the food network website and printed it out. I still have that print out which is now wrinkled and covered in stains. The bread comes out moist and yummy every time. I normally make it with walnuts, but today I switched it up and used macadamia nuts. Mix the flour, baking soda, and salt into a medium bowl, set aside. Whisk the eggs and vanilla together in a liquid measuring cup with a spout, set aside. Lightly brush a 9 by 5 by 3-inch loaf pan with margarine, then cover with parchment paper and butter again. (This makes it really easy to remove from the pan). Preheat the oven to 350 degrees F.
In a standing mixer fitted with the paddle attachment, cream the margarine and sugar until light and fluffy. Gradually pour the egg mixture into the butter while mixing until incorporated. Add the bananas, mix, and remove the bowl from the mixer. With a rubber spatula, mix in the flour mixture until just incorporated. Fold in the nuts and transfer the batter to the prepared pan. Bake for 50 to 55 minutes or until a toothpick inserted into the center of the bread comes out clean. Cool the bread in the pan on a wire rack for 5 minutes. Turn the bread out of the pan and let cool completely on the rack. Wrap in plastic wrap. 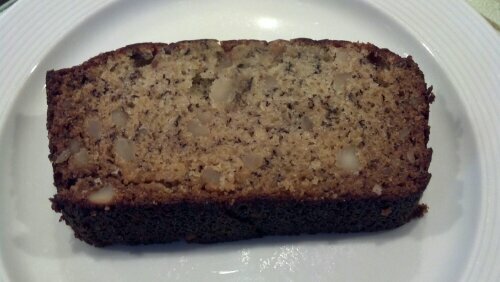 The banana bread is best if served the next day. 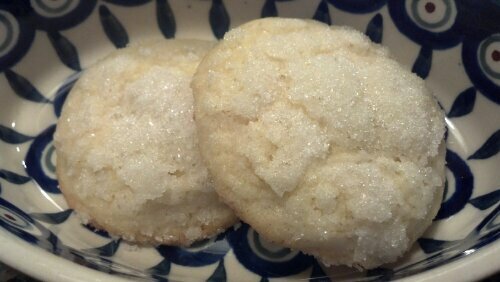 My Mom found this sugar cookie recipe on the Land O Lakes website. She is in Florida for the winter, so I made some the other day and mailed them to her. They came out quite delicious! The cookie is tender and the top is covered in crunchy sugar. This is also an easy recipe to make since all of these ingredients are staples in your kitchen. Combine 1 cup sugar and the butter in mixing bowl. Beat on medium, scraping bowl, until creamy. Add egg and mix until well combined. Add flour, baking powder, and salt. Mix on low until well combined. Place remaining 1 cup of sugar in a small bowl, and fill another small bowl with water. Shape dough into 1 inch round balls. Dip balls halfway in water and then into sugar. Place on baking sheet and bake 10-12 minutes or until very lightly brown on edges. It is Sunday and chilly outside so I can’t think of anything better to do than make chili and hang out indoors all day. My husband and I researched slow cooker chili recipes yesterday and this is the recipe we developed. Add all ingredients to slow cooker and mix well. I have always wanted to make macaroni and cheese from scratch. Well tonight was the night I finally did it! It is truly delicious. I found my recipe from the pioneer woman and changed it a bit for our tastes. My husband says he will eat any recipe that woman makes. LOL! Cook macaroni for 5 minutes and drain. Beat egg in small bowl and set aside. In a large pot, melt butter and add flour. Whisk constantly over medium-low heat for about 5 minutes until lightly brown. Pour in milk and mustard and whisk until combined. Cook for 5 minutes and reduce heat to low. Pour some of the milk mixture in to the egg and whisk, trying to avoid scrambling the egg. Then gradually add egg mixture to milk mixture whisking constantly. Add salt, pepper, garlic salt, paprika, and cayenne pepper, and stir to combine. Taste to make sure it is well seasoned. Add more salt or pepper if needed. Add macaroni to cheese mixture and stir to coat. Pour into a buttered 13×9 baking dish. 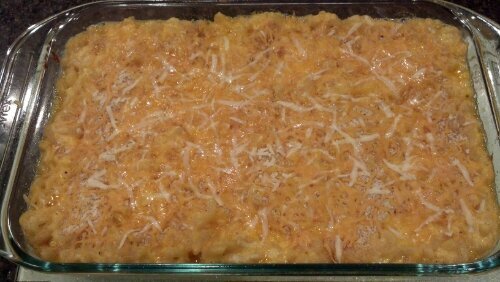 Top with breadcrumbs, additional cheddar cheese, and a couple dots of butter. Bake at 375 F for 15 minutes.